A research program focusing on Finite Element (FE) modeling and analysis of Stable Unbonded- Fiber Reinforced Elastomeric Isolators (SU-FREI) under both vertical and lateral loads was initiated in 2009 at McMaster University. FREIs comprise alternating bonded layers of rubber and fiber reinforcement. The fiber reinforcement layers, which have no flexural rigidity, constrain lateral bulging of the rubber layers within the isolator. The rubber layers, which provide lateral flexibility in the isolator, remain nearly incompressible and experience very large strains under large lateral loads. A Stable Unbonded (SU)-FREI is simply placed between the top and bottom rigid contact supports without any bonding at the contact surfaces of the isolator. FE-analysis of a SU-FREI demands advanced FE-software capable of addressing incompressibility, large deformation, and large strain of the rubber layers, and simulation of contact boundary conditions of the isolator. Due to the unbonded boundary conditions of the isolator, a laterally deformed SU-FREI exhibits rollover deformation when its top and bottom faces partially roll off the contact supports (Fig. 1). 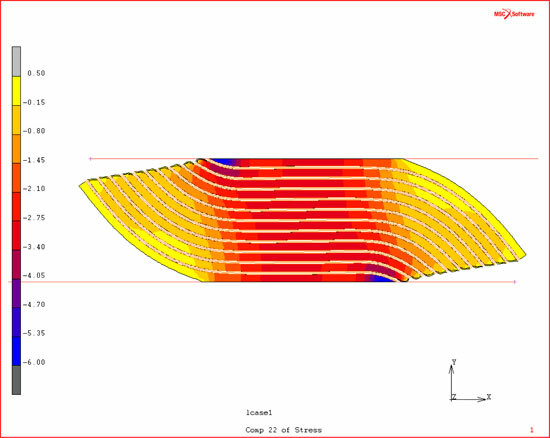 As a result of the rollover deformation the contact area at the top and bottom supports (boundary conditions) changes. When rollover deformation occurs, one end of the outer rubber-layers detaches from the contact support while the opposite end is pressed against the contact support (see Fig. 1). Accordingly, in the FEanalysis, the rubber elements at the pressed ends may experience severe distortion such that they no longer accurately discretize the problem. As the lateral load is increased, the intermediate rubber-layers of the isolator may also experience local excessive distortion. Most advanced finite element programs automatically terminate the analysis if excessive distortion is detected in the finite element assemblage in order to preserve the accuracy of the FE-analysis. To resolve this limitation in problems with large deformations/strains, the FEsolution can be mapped onto a new mesh that is adapted with the current deformed geometry of the model, prior to excessive element distortion in the original mesh. 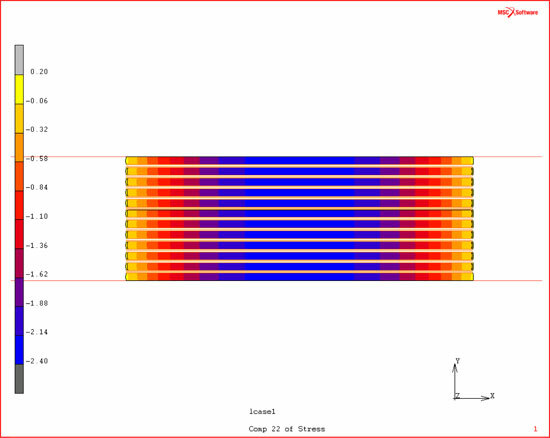 The new mesh arrangement results in a new finite element problem. The analysis is then continued by treating the solution from the previous mesh, at the point of mapping, as the initial conditions of the new finite element problem. In many advanced FE-programs the remeshing procedure is not carried out automatically. As a result, user developed subroutines that work with the manual remeshing capability of the software for each step of the remeshing are required. To conduct the FE-analysis of SU-FREIs, the global remeshing procedure available in Marc (2008a) was used. A unique advantage of Marc is its automatic global remeshing capability which is very effective and more user-friendly compared to many other commercially available advanced FE-softwares. Marc's remeshing procedure by default utilizes the updated Lagrangian formulation that is suitable for the FE-modeling of large strain problems. Although user can specify the approximate dimensions of elements in the original FEmesh, the updated mesh that is created by Marc, if required, can be finer in the regions of high-strain gradients in the rubber layers. A competitive advantage of Marc is that all these FEmesh adjustments are conducted automatically. The FE-modeling of 2D SU-FREIs has been successfully completed using Marc. In the developed FE-model, the rubber layers are modeled using Herman elements that are intended for incompressible materials. The software automatically remeshes the rubber layers based on set of criteria available in Marc. To simulate the boundary conditions, an appropriate contact formulation from several models available in Marc has been selected.